Where we stand to date November 2016. The structural plans have been submitted to the state of Ohio for approval as of November 26th, 2014 for the building of the shell. Approved. We started construction June 4th-2015 and erected the shell of our shelter. We do not receive any funding from the County (Carroll) or the State (Ohio), but rely solely on donations, fundraisers, grants, living trust and monetary gifts. We are not associated nor do we belong to any animal organizations locally or within the United States. January 18th, 2007 - Organized the Carroll County Animal Protection League - first meeting. July 15th, 2008- Received a $50,000.00 restricted endowment gift from the Carroll County Humane Society, (Carroll County, Ohio), July 15th, 2008. They gave us until July 15th, 2013 to build the animal shelter or this money has to be returned to them. We have recently asked for an extension, but they will not give us one. We will have to return the $50,000.00 by July 15th, 2013 plus the interest this money has earned in a separate savings account if the animal shelter is not built. July 1st 2009- Purchased 5.393 acres on State Route 43 between Carrollton, Ohio and Malvern, Ohio. (physical address is: 4901 Canton Rd. NW. Carrollton, Ohio - Carroll County). By the generosity of two anonymous members, they co-signed for our loan from Consumer's National Bank of Carrollton, Ohio to purchase this acreage at a purchase price of $29,000.00 with a $1,000.00 grant by the Carroll Electric Cooperative "People for People Fund" to acquire our $28,000.00 loan on our land. 2009-to present: Hired Mr. Patrick Cooper of Willoughby and Company, Inc., New Philadelphia, Ohio to do our audits and taxes for the last four years at a cost of $4500.00 for 2009 (one-year audit and two year audit 2010-2011) which includes our 990 taxes to the IRS and State of Ohio Attorney General's Office. June 2009-to present- Hired Mike Hettler of Hettler Engineering, Company, North Canton, Ohio, to be our engineer. Mr. Hettler designed the two-way driveway entrance which we had to install according to ODOT (Ohio Department of Transportation) regulations for our entrance off of State Rt. 43. Mr. Hettler also designed the L-shaped parking lot, and the animal shelter site. We paid Mr. Hettler in full $9,395.46 for his expertise services to accomplish both undertakings we had to do to start preparing for the animal shelter construction site. Mr. Hettler also designed the sewer system needed for the animal shelter and these plans have been sent to the State of Ohio and have been paid for and approved to use when we are ready for the installation. October 2010- Accepted Shecklers Excavating, Inc. bid to install the two-way driveway at a cost of $16,700.82. Almost half of this cost was covered by grants, CCAPL members, and individuals donations. The rest was covered by our numerous fund-raising activities. October 2011 - Accepted Shecklers Excavating, Inc. bid to dig out the L-shaped parking lot, animal shelter site pad, grade and install two catch basins, one storm drain, and also put down 410 ton of limestone for the L-shaped parking lot at a cost of $34, 152.00. Almost half of this expense was paid by grants, individuals, CCAPL members, and an anonymous donor with a living trust donation and the rest raised by our numerous fund-raising activities. March 2011 - Hettler Engineering, submitted our sewer plans to the State of Ohio and they have been paid for and approved. May 2012 - Leased our mineral/gas rights on our property to Chesapeake Energy which in-turn enabled us to payoff our loan to Consumer's National Bank and the balance put into our checking account. June 2012 - Signed with Morton Buildings Inc, to do our animal shelter floor plans at a cost of $5,000.00 which has been paid in full. Lorna Whaley, a CCAPL member and Board of Director, was our Conceptual Planner in designing the animal shelter floor plans along with the valuable input from the Animal Shelter Construction Committee and the CCAPL's Board of Directors. The Animal Shelter Construction Committee researched and visited numerous animal shelters in Ohio and also one in Tennessee to implement different ideas for our shelter plans with the public's, volunteer's, and the animal's safety and well-being utmost and foremost. May 2014 - Signed with Morton Buildings, Inc. Shawn Simmerman, Project Consultant, and paid Morton Buildings, Inc. $22,500.00 for all the mechanical plans and permits for the architectural, structural, electrical, plumbing, and HV/AC designs by Electro-Mech Engineering of Canal Fulton, Ohio. This will take approximately 4-6 months. This is the step II before construction can begin. Step III is the actual starting construction of the "shell" for the animal shelter. We have raised the money for Step III at a cost of $129,500.00. 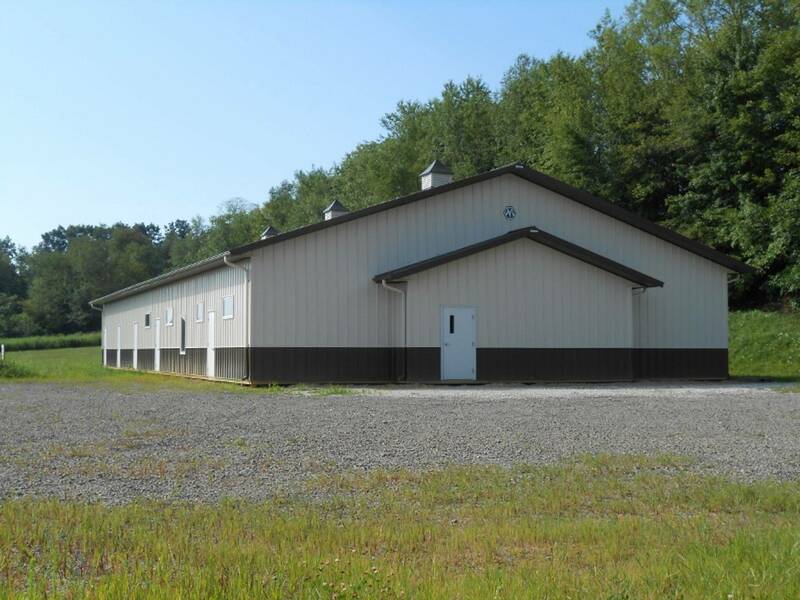 June 3rd, 2015 - Morton Buildings, Inc. delivered our building and was completed in two weeks. November 2015 - Found out we do not have to install the sewer system or drill a well because the Malvern sewer and water system will be coming down from Malvern, Ohio for us to hook up to. January 2016 - The CCAPL Board of Directors approved the plumbing plans. We are currently accepting bids to choose a plumbing contractor for the rough-in plumbing. (This includes all plumbing which will go underneath the cement before it is poured. Once the plumbing is done, we will have the cement poured by a contractor and will then work on the electrical phase of construction. May 2015 - Summit Testing & Inspection Co. of Akron, Ohio - necessary soil testing for where the animal shelter will sit. Passed. Cost: $3,964.00. May 2015 - Sheckler Excavating, Inc. removed the vegetation on the site pad and limestone on the site pad base at no charge to us. June 3rd, - June 23, 2015 - Morton Buildings, Inc. erected the "shell" of the no-kill animal shelter. August 27 - 2015 - Signed papers for sewer permit to the EPA/Treasurer State of Ohio for re-submission. As of 2016, we have $317,155.28 invested in our land, which includes the yearly liability insurance premium of $2,090.00 and coverage on the building. We have raised all of this through fundraisers, grants, living trusts & donations from members and the general public. September 18, 2015 - Received the sewer system permit from the Ohio EPA. November 2015- Found out we do not have to install the $56,000.00 sewer system but can hook up to the Malvern-Carrollton sewer system and water when it comes down Rt. 43 possibly in 2017. January 2016 - CCAPL Board of Directors approved the plumbing plans. May 2016-Paid for the plumbing permit by the state at a cost of $1,620.00. June-July 2016 -Smith Piping, Co. of Carrollton, Ohio started the rough-in plumbing. August 2016 - Hired new engineers, HEI Engineering Group, Inc. of Wooster, Ohio to re-do the Electrical to accommodate the Geothermal Heating and Air Conditioning system before the cement can be poured throughout the shelter. Once the plans are approved by the State of Ohio and the permits issued we can have the cement flooring installed in the spring. November 2016: Signed the contract for Richmond Concrete, Carrollton, to install the cement in the spring of 2017. As of November 2016, we have $317,155,28 invested in our land, which does not include the yearly insurance premium of $2500.00 a year. January 2017- We are currently having the electrical, geothermal, and other mechanical plans corrected and updated by Stadelman Engineers & Associates. Once these plans are corrected and done, we will submit them to the State for approval and permits. May 2017 - Accepted bid from Richardson Electric of Carrollton for the installation of all electrical work. $89,400.00. They will work with American Electric Power for the new pole, transformer, electric lines to the building. AEP approx. cost: $7-9,000.00. June - 2017 Richmond Concrete and Smith Piping Co. of Carrollton, started the interior work preparing the sub floor for installation of the cement. June - 2017 Accepted the bid from Robert's Heating and Cooling of Wooster for the Geothermal system. $149,800.00. June 2017 - Accepted the bid from David Flanary Construction for the Interior stud walls for $8,569.00 plus bond. June 2017- Signed the American Electric Power (AEP) contract to start the process of "Start up electric" - $1,515.05. (They will be setting up a new pole, transformer, and electric lines to the building.) Cost of pole, transformer, etc. to be determined by AEP. June 22, 2017 - Richmond Concrete will be ready to pour the concrete in a couple weeks, as soon as the State inspector approves what has been done so far in preparation for the cement. July 19, 20, & 21 - 2017 - Richmond Concrete poured the main room and three sections of the kennel room. Cost: $46,755.50. September 2017 - Smith Piping Co. of Carrollton finished the drains and capped them. October 2017 - Morton Buildings, Inc. installed the steel kennel ceiling which included the plastic barrier, the attic access door, and insulation throughout the ceiling. October 2017 - Trench dug to lay the 3 conduit pipes for the electrical lines underground and pulled the electrical lines through the conduit from the main panel boxes to the power pole. Ran the conduit pipes up beside the power pole. Please go to our "Construction page" for updates- thank you. We have accomplished so much since our beginning and have more to do. We know many are anxious to see our animal shelter built, but as anyone knows when designing and building a public building, it takes many dollars to do plus the planning, strategy, and steps in preparation. It is a continual learning process to undertake this monumental task, but we started out knowing this, and have moved so far forward since we started January 18th, 2007. We will continue in our efforts to build a greatly needed animal shelter for Carroll County, Ohio to save lives of many precious domestic animals when they will come under our care in our no-kill animal shelter. Note: Realistically, euthanasia may have to be done, and will only be conducted with the recommendation of a licensed veterinarian but never for needed space. We will be an asset to the community. Example-Vaccinations: We will help create a safer, cleaner Community. Because homeless companion animals remain unvaccinated, from a public health point of view, they could be regarded as a health hazard, serving as a bridge between rabid wild animals and the human population. Homeless animals spread disease to other homeless and wild animals. Homeless animals are forced to defecate in public areas or on private lawns. Homeless animals are forced to find food in trash containers or may destroy property in search of food. Cost to build the no-kill animal shelter is: $800,000.00 and more from start to finish. Many items will be required to take care of an animal entering our shelter and for general operations. We will also implement safety features for the animals, volunteers, and also for the general populous which will enter our shelter for adoption procedures and visitation. We feel once construction is underway and is seen by the general populous, members, and also visitors to Carroll County, Ohio, will increase monetary donations and donations of items needed for the animal shelter will increase also. We have started applying for grants and other funding resources to procure funding for many needed items for the inside needs of the animal shelter such as plumbing, cement, electrical, heating/cooling system, security system, and so much more. We will pursue grant funding and other entity resources to supply the majority of these needs, plus continue our many fundraising events. We thank you and the general populous for the continued support to reach these accomplishments. Donate locally. Thank you.